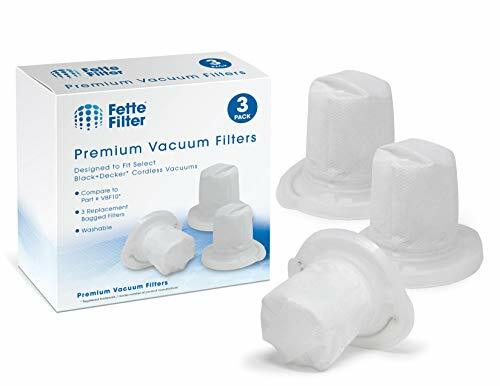 Fette Filter CrossWave Brush Rolls & Vacuum Filters Compatible with Bissell. 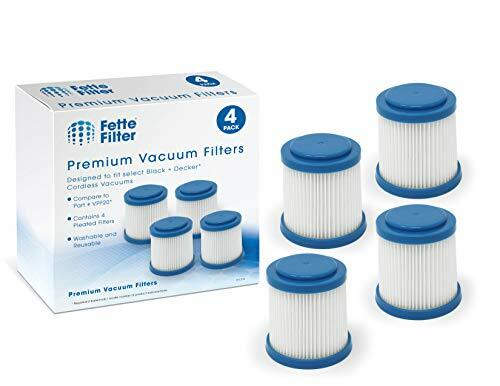 Vacuum Pre-Filters Compatible with Dyson DC58, DC59, V6, V7, V8. Contains 3 premium filters. Compatible with Dyson models: V8 Absolute, V8 Animal, V7 Absolute, V7 Motorhead, Dyson V7 Animal Plus, V6 Absolute, V6 Animal, V6 Animal Extra, V6 Motorhead, V6 Motorhead Exclusive, V6 HEPA, V6 Cord-free, V6 Baby+Child, V6 Car+Boat, V6 Top Dog, V6 Trigger, DC59 Animal Exclusive, DC59 Animal V6, DC59 Motorhead, DC58. Compare to part # 965661-01. Packaging may vary. This is not a Dyson OEM product. The Dyson brand names and logos are the registered trademarks of their respective owners. Any use of the Dyson brand names or model designations for this product are made solely for purposes of demonstrating compatibility. 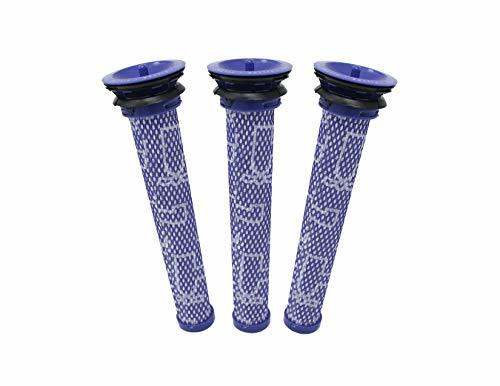 Vacuum Pre-Filters Compatible with Dyson DC58, DC59, V6, V7, V8. Compatible with Dyson models: V8 Absolute, V8 Animal, V7 Absolute, V7 Motorhead, Dyson V7 Animal Plus, V6 Absolute, V6 Animal, V6 Animal Extra, V6 Motorhead, V6 Motorhead Exclusive, V6 HEPA, V6 Cord-free, V6 Baby+Child, V6 Car+Boat, V6 Top Dog, V6 Trigger, DC59 Animal Exclusive, DC59 Animal V6, DC59 Motorhead, DC58. Compare to part # 965661-01. 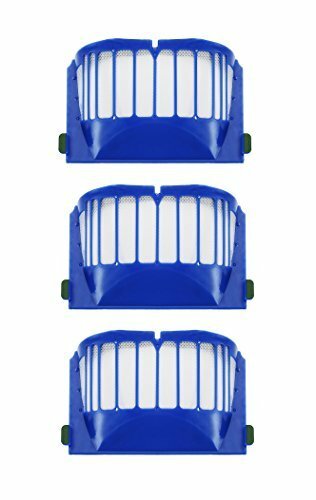 3 pack Filter For use with iRobot Roomba 500 or 600 Series : ex: 550 560 650 620 etc Changing filter every 2 - 3 months recommended (Varies dependent on environment / use). Remove dustbin and slide filter out to clean or change. Filters maintain optimal cleaning performance. Filters reduce infiltration of dust, pollen and other allergens. Prevents dust and dirt from escaping vacuum system. Shark Navigator Zero-M Lift-Away Speed Upright Vacuum ZU562. Compare Part to # XFFK560. Packaging may vary. This is not a Shark OEM product. The Shark brand names and logos are the registered trademarks of their respective owners. Any use of the Shark brand name or model designations for this product are made solely for purposes of demonstrating compatibility. 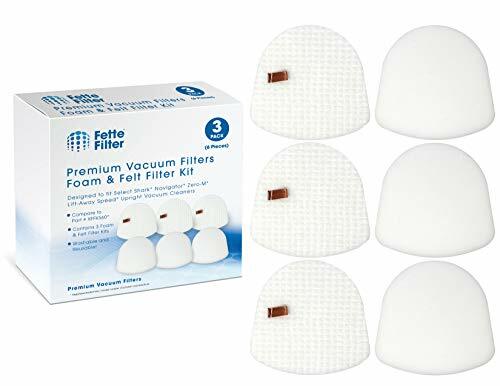 Fette Filter - Hand Vac Filter Compatible for Black + Decker VBF10. Compatible with Dustbuster Models HHVJ315JD10, HHVJ315JMF61, HHVJ315JMF71, HHVJ315BMF22, HHVJ320BMF26, HHVJ320BMFS27, HHVJ315JDP27. Dustbuster Hand Vacuum Pet (Purple) HHVJ315JDP27 Compare to Part # VBF10. Packaging may vary. This is not a Black + Decker or SMARTECH OEM product. The Black + Decker and SMARTECH brand names and logos are the registered trademarks of their respective owners. Any use of the Black + Decker and SMARTECH brand names or model designations for this product are made solely for purposes of demonstrating compatibility. HFEJ415JWMF, HSVJ415JBMF, HSVJ520JMBF, HFEJ415JWMF22, HFEJ415JWMF10, HSVJ415JMBF22, HSVJ415JMBF71, HSVJ520JMBF27, HSVJ520JMBF61. Compare to Part # VPF20. This is not a Black + Decker or SMARTECH OEM product. The Black + Decker and SMARTECH brand names and logos are the registered trademarks of their respective owners. Any use of the Black + Decker and SMARTECH brand names or model designations for this product are made solely for purposes of demonstrating compatibility. Compatible with Black + Decker SMARTECH 2-in-1 Cordless Lithium Stick Vacuums, Dustbuster Hand Vacuum Pet HHVJ315JDP07, PET 2-IN-1 Cordless Lithium Stick Vacuum with SMARTECH HSVJ520JMPA07, Dustbuster Hand Vacuum Pet with SMARTECH + Base Charger HHVJ325BMP07, HFEJ415JWMF, HSVJ415JBMF, HSVJ520JMBF, HFEJ415JWMF22, HFEJ415JWMF10, HSVJ415JMBF22, HSVJ415JMBF71, HSVJ520JMBF27, HSVJ520JMBF61.